In the previous post we saw how to start an Amazon EMR cluster and have it execute a Hive script which performs a basic aggregation step. This post will take up the Big Data thread where we left off at the end of the previous 2 series on the blob storage component Amazon S3 and the NoSql data store DynamoDb. Therefore the pre-requisite of following the code examples in this post is familiarity with what we discussed in those topics. The next task is to apply what we’ve learnt in this EMR series and run some type of aggregation. We’ll extend the Amazon Kinesis demo console application that we built in the series on Amazon Kinesis and S3 so have it ready in Visual Studio. It currently has two modules: AmazonKinesisConsumer and AmazonKinesisProducer. Our goal is to calculate the average URL response times over customers and URLs. Imagine that you have a website that several customers use. You’d like to see how the average, minimum and maximum response times of the pages on your web sites vary across customers. 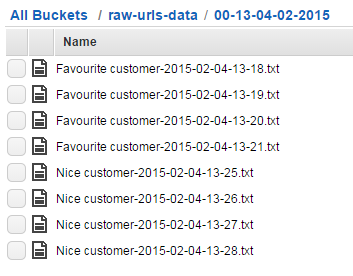 Recall that the Kinesis consumer application saved all raw data observations in a top bucket called raw-urls-data in S3. Clear the contents of that folder now so that our new tests don’t get mixed up with any old data. Let’s generate some new data in S3 so that they make sense for our planned aggregation purposes: count the average, min and max response time per customer and URL where we imagine that we measure the response times of our own web site which is used by different customers. Start AmazonKinesisProducer and insert some data records over at least 2 customers where each customer has at least two data records for a single URL so that we can count meaningful averages. Here are the values I’m going to enter. 18 records should be sent to our Kinesis channel. Take a note of the folder name. 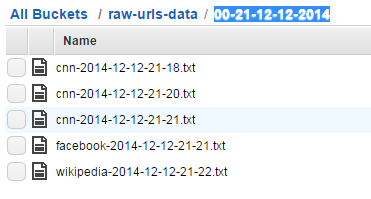 In the above example it will be “s3://raw-urls-data/00-13-04-02-2015”. 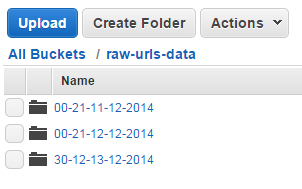 Upload the file to the raw-urls-data folder in S3 so its full address will be s3://raw-urls-data/hive-url-aggregation-script.txt. We’ll use this reference in code later on. We’ll reuse our DynamoDb table called “aggregation-tests” that we set up in this series on EMR. Clean all existing records from it. We’ll hide the aggregation mechanism behind a basic interface. The reason is that we’ll look at an aggregation alternative in the next series called Amazon RedShift and we’ll want to change the actual implementation relatively easily. aggregationResult.ExceptionMessage = string.Concat("Final aggregation process status: "
If you’re not certain what this code means then revisit the previous posts on EMR, there’s nothing new here: we start up a new cluster, install Hive and Pig and then add a new Hive execution step to the waiting cluster. The cluster is then terminated. Set the selected console project as the startup project and start the application. Excellent, we have laid down a starting point for an aggregation mechanism using the .NET AWS library. This post concludes the series on Elastic MapReduce with .NET. The next series will take up yet another data storage and aggregation mechanism within Amazon Cloud: RedShift.